A few brief notes before the post. First of all, despite the fact that I am about to talk about some hard parts of pregnancy, I am NEVER not grateful. I do not take it for granted that I have gotten pregnant four times and so far have had three live and healthy babies. I know that is not everyone’s happy story and I have heard many of your stories and prayed with and for you as well. Knowing that I even have a pregnancy, difficult or no, is a blessing, despite the fact that this may sound whiny to some of you. Which brings me to my second point: I am about to talk about some things that are difficult for me. I don’t write it because I want to vent or because I am trying to drum up a lot of “we love you’s” or throw myself a pity party. I am writing very honestly about this because I know that there are other women out there who might be feeling some of these same things. Many of whom have it MUCH worse than I do. But better or worse, I think there is something special that happens when you know you’re not alone, when you know you have a community or even one other person who can say, “I know,” and mean it. I write this for you. That has to be one of the most overused phrases (both in movies and in real life) for pregnancy. Like any cliched phrase, there is some truth to it. Often pregnancy does result in a sort of glow. Sometimes from joy and sometimes from hormones and the sheer miracle (and it is a miracle) of your body growing another living person. Other times that glow is just the sheen of sweat because that beautiful pregnant woman has been vomiting all morning. Last week, I found myself almost crying in the dressing room of a Target in Orlando. I stood there, alone, looking at myself in the mirror. I don’t tend to look in the mirror that often while pregnant. I don’t feel like I’ve got a glow. (Click to Tweet) What I do have is a tendency to gain more weight that’s recommended, to swell up in the third trimester as soon as it gets warm outside. I get comments like, “Due any day now?” consistently when I’m 30 weeks pregnant. Surprised looks when I say, “Nope. Three months to go.” I avoid mirrors during pregnancy. But after the move I couldn’t find bathing suits before our trip to Florida. So I grabbed a few tops to try on, a few bottoms, and a few athletic shorts just in case I couldn’t handle bathing suit bottoms. I tried on a few things and I looked, really looked in the mirror. There was no glow. Instead, there were legs, ankles, and feet that had swollen up on the car ride, despite frequent stops. That stayed swollen in the 80-90 degree heat. I had no ankles. I had no knees. Just swollen, enormous legs. And now that we have come home from our trip, I have developed pregnancy mask, a discoloration of the skin pigments. It’s in my face, making me look like I have a dirty forehead and cheeks, and worst of all, a mustache. Just slight, but enough that it’s noticeable. I look dirty. I don’t feel beautiful, or even pretty. You can acknowledge a struggle and still be grateful. (Click to Tweet) You can be honest that you are miserable vomiting every day all day, but still be very joyous at the cause of your sickness. I cannot wait for this pregnancy to be over not only to hold a sweet and precious miracle baby, but also so I can reclaim what is left of my pregnancy-wrecked body. (For after four pregnancies, it surely is wrecked.) Yet I am so glad to have had this chance, this miracle, this baby inside me. I write this knowing that there are some women out there who, for whatever reason, struggle to feel beautiful while pregnant. Who hear about this glow they should have and yet don’t feel it. Who see other women who seem to be breezing through pregnancy and wonder why it is not so easy. I’m sure NO woman really breezes through a pregnancy, though there is a wide spectrum of how women are affected. I hope that this might bring some sense of encouragement, camaraderie, community. No two pregnancies are alike, but you are not alone. And it is okay to struggle even in the joy of something so miraculous and wonderful. 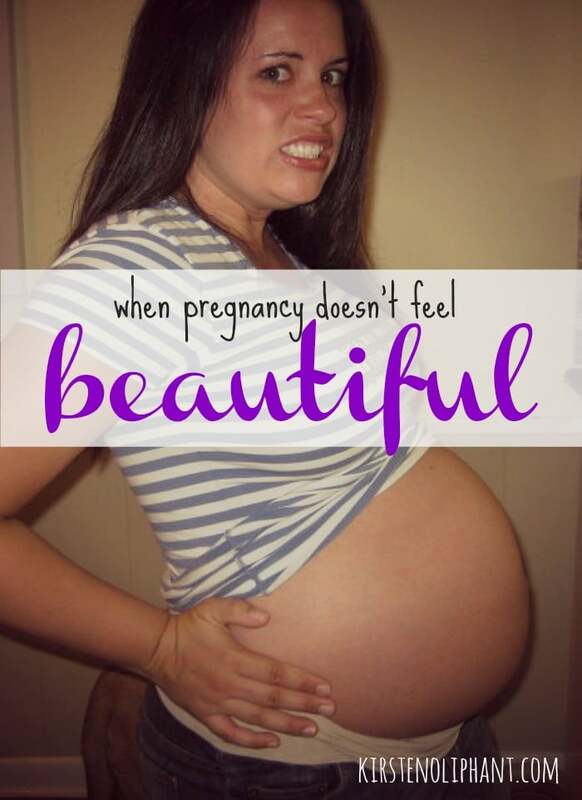 Is pregnancy a time when you feel beautiful? Do you feel the pressure to have some kind of elusive “glow”? Or are you longing to be pregnant even with the challenges? I’d love to hear from you in the comments about your experiences. Like this post? Signup for my weekly email! Want to know what you’re in for? Read past weekly emails. Do it now. Yes yes yes. To all of this! I grew way to big way to fast as well. I didn’t get the swelled feet until the last week or so.. but I know its horrible. And I avoided mirrors as well. I try hard not to ask any pregnant women if they are due any day either.. thats just a recipe for disaster. I can sooo relate! I am pregnant with my 3rd after having twins last year and I feel like my body is wrecked times 2. My body confidence fluctuates hourly! Thank you for posting something so real, and for pointing out that just because there are some struggles during pregnancy doesn’t mean that we aren’t grateful for the miracle of pregnancy and childbirth. Thanks for visiting! I can’t imagine the havoc twins would wreak on the body! One at a time does enough for me. Congrats though and I appreciate you reading! I’m currently about 33 weeks pregnant for the first time ever and I love the fact that I can be pregnant because I know even in my friendship group there are ladies who can’t for whatever reason. I’ve been fortunate that I’ve not really had sickness and things like that. I had superhuman smell for a little while which meant that going in the kitchen some days was agonising. One particular time I walked through the door turned on my heels and told the boys that I needed them to go and do whatever it was I was going to do because something was making me want to throw up. In the last few weeks I’ve had heartburn – one day I thought it was going to set fire to my ears it was that high up in my chest but it seems to have died off and if needed I have the indigestion tablets to hand – either that or a huge glass of cold milk which seems to help too. I think those women who go to awards shows and on the cat walk while pregnant must go home and put on their sweat pants and just collapse on the sofa to chill for the rest of the week lol. My husband works for a charity and they had their first market stall at the food market yesterday – somehow I ended up helping nearly all day – thankfully as part of my help they provided me with a chair so I could sit down between customers (or just give instruction from the seat as I did for the last two hours or so). I currently have the fun of swollen ankles – I thought I could get away with living in flip flops but it’s not been quite warm enough to potter around in them (and my not so nice toe nails put me off too lol. Normally they are covered in nail polish to hide them but oh yeah! reaching my toes is getting harder and harder – and I wouldn’t inflict them on anyone else lol). But I am thankfully for every fidget, whether it’s like now at 7pm or whether it’s in the middle of the night when I’m trying to sleep – sometimes I complain but deep down I’m grateful that those fidgets keep happening. The superhuman smell!!! I almost threw an air freshener out the window on the highway once because the smell in the car was making me heave. 🙂 I love the fidgets (now insanely strong movements) and those are the things that bring me joy when I’m feeling down about my feet and ankles or my sciatic nerve is killing me. Congrats to you and hope you get through the rest easily! 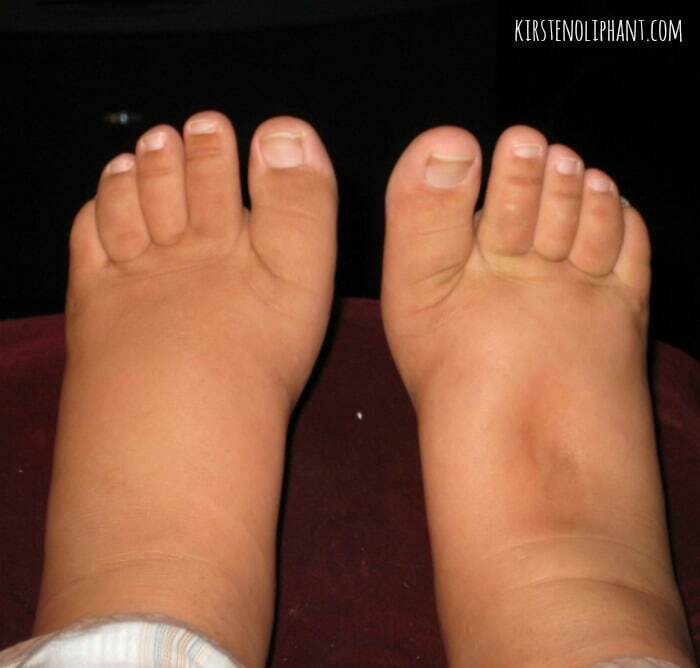 I’ve had three children and I’m pretty sure the ankles and other swellings, get worse with each child! 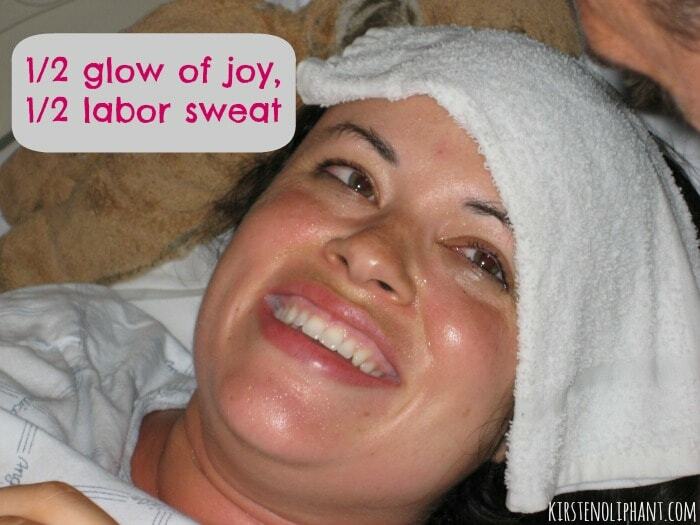 I looked like I was having twins too – -You are definitely not alone. But you’re a little bit wrong too – you ARE beautiful, even when you don’t feel like it. 🙂 I’m sure it took some bravery to post this, but it was worth it. Good job! Def worse each time. I gain less weight with each, but started heavier with each, so yeah. Ugh! Thanks for the encouraging words! I kept fainting. So I feel for you, girl! But God is showing us in so many ways that the move was a good choice (one of them being the fact that Kendall McFaddin lives around the corner and our husbands work together!). But now we are somewhat settled and I’m looking at a smiling 9 week old baby…and I have pretty much forgotten the pains of pregnancy and a third c-section. Maybe that is the most miraculous of God’s baby blessings–the ability to be so consumed by love that you can forget the horrors of pregnancy! So good luck and know you have prayers coming from many different directions. Yep, with my last pregnancy, I threw up every. single. day. until I was 38 weeks along. Let’s not even talk about how much it hurt to walk. Our culture really does a swell job of setting women up to feel bad when they don’t have this magical experience around pregnancy-childbirth-babies-and-nursing. It’s such a shame, because we should be allowed to experience That Which We Experience. And not: That Which We Are Expected to Experience. When our reality doesn’t match up with the expectation, we don’t talk about it, b/c we feel like we’re somehow defective if we’re not just glowing and swoony with joy all the time. And really, the only thing that helps is TALKING ABOUT IT. True of people who hate pregnancy, who are not able to have “all-natural” childbirths, who experience post-partum depression, who can’t (for a variety of reasons) nurse. Uh, baby just woke up. Stepping down from soapbox now. It’s funny how every pregnancy is different too. 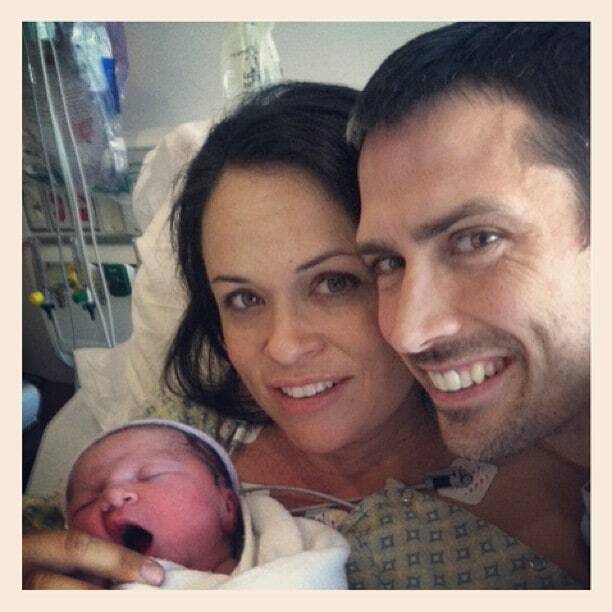 With my first, my son, I honestly had never felt more alive or pretty in my life. I was hardly sick, my skin and hair looked nicer than it ever had and I was so proud of my bump and only gained the recommended weight. Cue baby girl 12 months later. I was so sick the first trimester, so tired the whole time, I had pregnancy acne (for real why would there be such a cruel thing) gained weight and swelled up like a balloon and my luscious hair was limp and actually immediately began to fall out once I delivered- and continued to do so and my hair is still not the same. So yes, pregnancy can be both beautiful and ugly at the same time and both a source of absolute joy and source of upset simultaneously. Why? Because life and the miracle of it are not one dimensional. Beautiful and honest post. Def some of mine were easier than others, but all with the swelling as soon as it got hot outside. “Because life and the miracle of it are not one dimensional.” <--- YES!!! I’m 32 Weeks pregnant with our 1st and I have been WAITING for this magical glow everyone talks about pregnant women have! 🙂 My hair is thicker but more unruly than ever, and my hand, feet and ankles are so swollen!!! After trying for almost 2 years I’m so grateful to be pregnant like you said but why wouldn’t I look like Natalie Portman!?!?! I totally identified with this post, almost word for word! I know the exact feeling of not wanting to be ungrateful, but I really don’t enjoy being pregnant. I gain too much weight, don’t take any pictures, and try to ignore strangers comments (which is impossible). With my first pregnancy my were so swollen my flip flops didn’t fit. My second pregnancy I was 9 days overdue, in August, in a Houston. I had to carry a hanky and forgo all makeup because I literally had sweat dripping off my face for 3 months. I love that you keep things real on your blog, thanks for sharing the good and the bad! Thank you!!! I’ve received the twin comments stared at my feet with tears in my eyes and feel sorry for myself over the stretch marks I have now received. I realize how lucky I am but this is hard it is not easy and thank you for making it ok to say. This is wonderful. My fourth (and final planned) son to come home is 3 weeks old. Although I would not consider my other pregnancies easy, the joy of becoming a mother carried me through my three term pregnancies with little misery recognizable in public. Even my miscarriage was early leaving many unaware that it even happened. This last one really beat me up (especially combined with the worst winter in recorded history). I started avoiding social commitments because I just couldn’t deal with my friends and acquaintances asking the same series of questions and making the same comments on how big and uncomfortable I looked for the last 20 weeks of my pregnancy. Being the last one I REALLY just wanted to enjoy every minute and felt guilty and ungrateful every time the pregnancy got the best of me. I look at my son now and would do it again with thinking twice, but I definitely understand where you are coming from. I love what you said when you never know how vain you are until it’s stripped from you. Totally true! I recently had an appendectomy which left me with two scars and wrecked my belly button. I never knew I cared what my belly button looked like until it changed! Thank you! Thank you for writing this. I am pregnant with my 4th son & you have written exactly how I feel. I am a personal trainer, I know good nutrition like the back of my hand. Being vain is a part of my job, and yet everytime I get pregnant, I look like a slob. I gain weight at astonishing amounts. My hair & skin look dull & unclean, no matter what I do. And wear I gain weight on my body makes clothes, even maternity, look awkward. I am in the same boat as you. I love that I feel this sweet little boy growing stronger everyday, his kicks and jabs make me laugh out loud at times. But looking in the mirror & not recognizing your own face because your nose is swollen 3 times its normal size, or catching a glimpse of your growing rear end & muffin top makes it hard to feel beautiful while you are doing a beautiful job of making a life inside you. You want to tell people “I don’t always look like this!” Thank you for giving a voice to the cause, because I know for a fact that you aren’t alone! Thank you so much for this! I came across this on Pinterest and glad I read it. I’m pregnant with my second baby, my current baby is 7 months old. It was a bit overwhelming since my first was so difficult. I feel exactly like you did, everything you said. It’s hard to even tell your friends how you feel because you feel like you constantly have to say “I’m very grateful, but…” . So again, thank you for this. Came across your post.. and exactly the read I needed today.. 21 weeks and I feel like I popped out over night. Not comfortable in my skin at all and trying my best to enjoy the blessings..